Fireballs, meteors, asteroids, oh my! A meteor disintegrating in the atmosphere over Texas this past Saturday generated national media coverage and prompted calls to NASA. See CNN’s Nov. 9 report for a quick version of this “fireball” story. 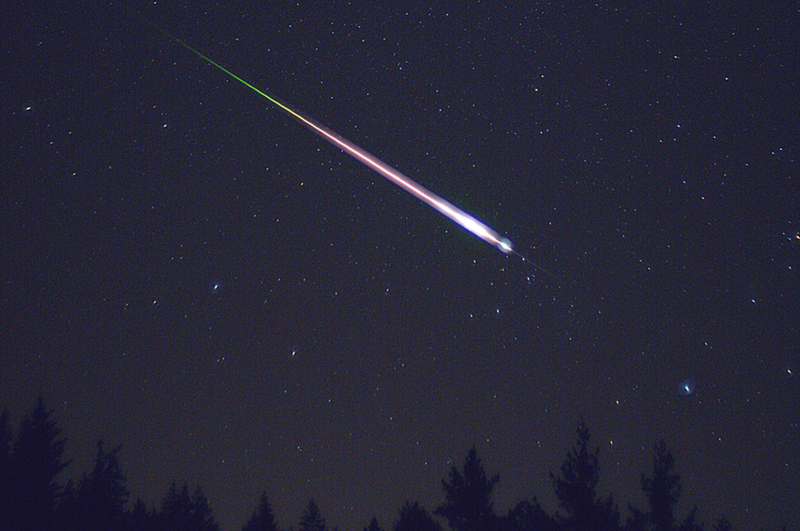 It seems that people are seeing meteors and fireballs all the time these days…. My explanation for this development is that 1) since the Chelyabinsk event of February 2013 – the spectacular disintegration of a small asteroid in the atmosphere – people are more aware of the phenomena, and 2) due to the ubiquity of smartphones and other handheld imaging and communication devices – not to mention dashcams, which yielded an impressive real-time record of the Chelyabinsk event – information about events such as fireball sightings spreads around the globe in near-real time. If you’re wondering whether Earth is being bombarded by objects from space these days, the answer is yes. If you’re wondering whether the current situation is unusual, the answer is no. (Stay tuned for more information on the frequency and distribution of bolide impacts with the atmosphere…coming soon….) If you’re wondering whether Earth is at risk of being smacked by an asteroid or comet big enough to cause serious damage, the answer is no, not at the moment, not as far as anybody knows. Then there’s NASA’s Near Earth Object Observations Program and its program office at JPL (see above). The NEOO program is tasked with finding, tracking, and characterizing NEOs. Again, as far as I can tell, this program is not explicitly tasked with monitoring fireball events 24/7. Outside NASA, the American Meteor Society, founded in 1911, is a pro-am astronomy group whose members “observe, monitor, collect data on, study, and report on meteors, meteor showers, fireballs, and related meteoric phenomena.” If you want to see where fireballs have been sighted lately, see this group’s website, which offers lots of other information as well. You can also check out the International Meteor Organization (IMO), “founded in 1988…in response to an ever growing need for international cooperation of meteor amateur work. The IMO has a “fireball” page as well. If you see what you think is a fireball, you can report it to the AMS or the IMO. See their websites. Here’s a final thought for the day. I’ve theorized that more people are seeing meteors and fireballs because they are more knowledgeable about the phenomena than they were just a few years ago and because they have the means to record them. It also seems that news-media reports of UFO sightings are mighty scarce these days. Yes, MUFON lives on, and UFOlogy gets plenty of play on infotainment TV channels such as the Discovery Channel, the Learning Channel, the Science Channel (all owned by the multibillion-dollar media mega-corporation Discovery Communications), the History Channel, and Sy Fy. But the mainstream news media don’t seem to be reporting on UFO sightings these days. Could there be a correlation between a better understanding of natural phenomena and fewer claims of alien spaceship visits to Earth?